For those of you who know me well, I LOVE Christmas, in fact that is probably understatement of the century!! When all the shops start stocking the festive products, and everyone else is groaning that it's too soon, my blood pressure is sky rocketing with excitement. No exaggeration! So, about two months ago, I made these lovely stockings - having bought a few, and being quite OCD, I like things matching, but also found a great pattern to use. I like a challenge, especially one that means I can escape into a project which in theory I should be able to do! What I didn't realise is that the pattern I bought was made for felt, and so were the instructions... what I wanted was a lined fabric stocking - can't be too difficult to adjust surely!? Well, I spend a couple of evenings trying to get it right, but got there in the end, and I'm SO pleased with them. I have taken pictures of each stage so that if you would like to have a go at making some, you can print off a tutorial. I reckon if you are just doing them in evenings, you could make one stocking over two evenings. If I was making these all day, I reckon I could have done all five over a whole weekend - it did take me longer as I was trying to work out the best way of doing that but I have done that hard work for you! They are perfect size for not holding a lot if you are a larger family like ours. They would hold a few small things but wouldn't be wide enough to hold a DVD - if I was making them again I would probably make them double the size if I wanted them purely as large stockings but they are perfect size to hang on a fire place. We only plan to put a small gift in, socks, chocolate and that sort of thing - perfect size for us as everyone gets main presents in their Christmas Sacks. 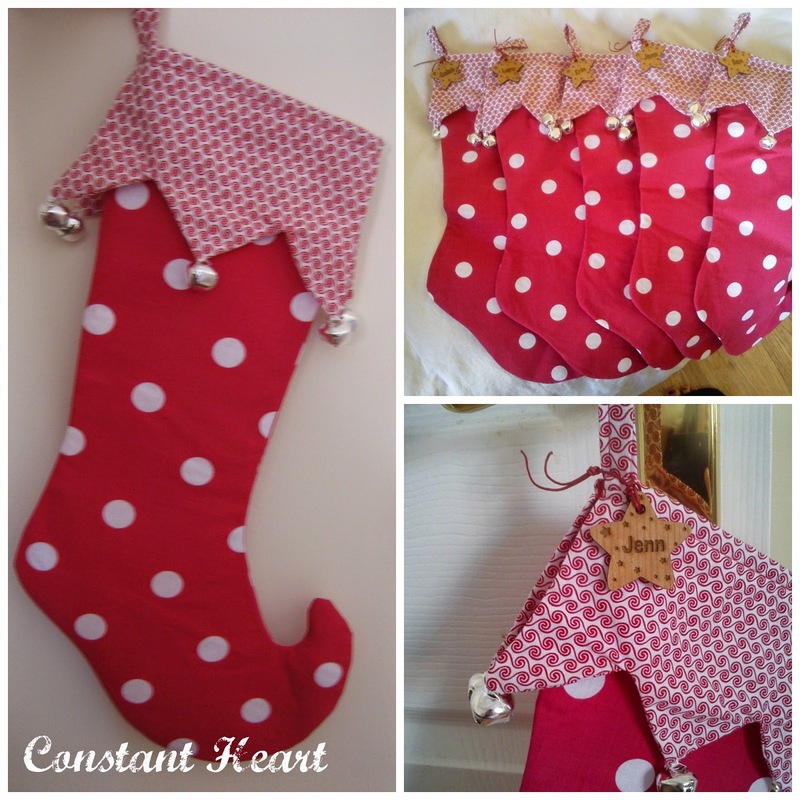 I had the help of Shani over at The Crafty Giraffe make me the wooden stars to go on each stocking. You will need McCalls MC299 Christmas Stockings Pattern, enough fabric for your project (it gives details on the back of the pattern - remember to double this if you want to line it like I did), medium weight iron on interfacing (enough for one layer of each side of the boot per stocking), sewing machine ideally, 6 x 20mm bells per stocking, and some toy stuffing filling fibre (the toes of the boots are stuffed so they hold their shape whilst empty). Add some thread, fabric scissors, and iron and an ironing board, creativity and a little patience and voilà, you are ready to get started. The pattern is for a single layer felt stocking - if you want to make a simple one and add bells then that would be just as nice and save you a lot of effort :-) I also plan on making some mini ones using the pattern for Christmas tree decorations but that can wait for another year! Fancy a go!? Click Here for the Constant Heart Tutorial!